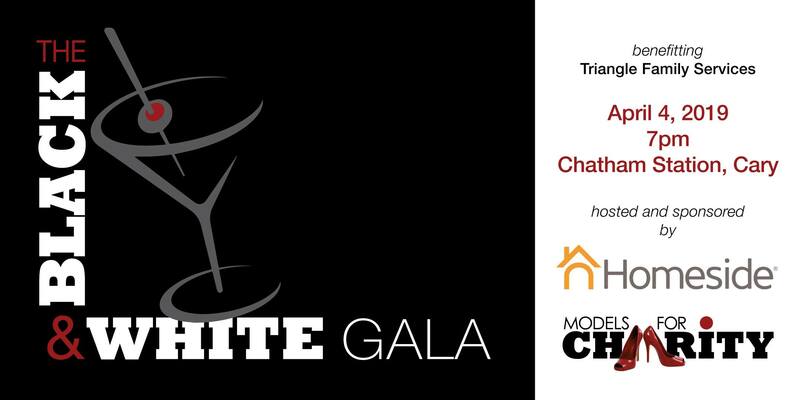 Benefiting Triangle Family Services, Models For Charity’s 9th Anniversary Black & White Gala will feature our signature runway show, DJ Supr Dupr, dancing, an awesome silent auction featuring local businesses, a “Stock Your Bar” raffle, delicious food and great beverages including a signature cocktail from Social House Vodka, beer from Bond Brothers and MUCH MORE! $45 General Admission Ticket – includes event admission, one drink ticket*, food and treats. $75 VIP Ticket – includes a swag bag, seat for the runway show, food and treats, signature cocktail, VIP wristband for open bar access and a raffle ticket for the STOCK YOUR BAR grand prize! $400 Table of Four Package – includes table seating for 4 guests during the signature runway show, VIP wristband for open bar access, a bottle of champagne for the table, swag bags and a ticket for each guest for the STOCK YOUR BAR grand prize!